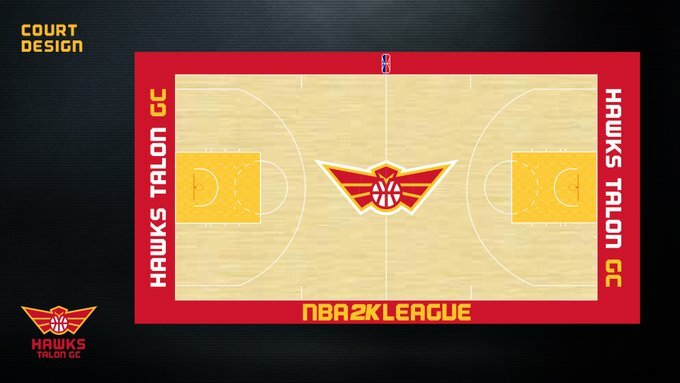 Hawks Talon GC has unveiled its virtual uniforms and court for the 2019 NBA 2K League season. The team’s Association Edition uniform is white with red and yellow accents while the player’s number and gamer tag appear on the back in red. The team’s Icon Edition uniform is red with yellow and black accents, while the player’s number and gamer tag are on the back in yellow. The NBA 2K League logo can be seen on the uniforms in two places: the first, on the back of the jersey centered above the gamer tag and the second, on the front right of the shorts. Lastly, both the Association Edition and Icon Edition uniform shorts feature Hawks Talon GC partial logo and wordmark down the side of the shorts. The jerseys were produced in concert with ChampionUSA, which became the official apparel and jersey partner of the NBA 2K League over the offseason. The Hawks, one of four 2019 expansion teams, tip off their season on Thursday with group play in the Tipoff Tournament against Pacers Gaming and Warriors Gaming Squad. Led by head coach/GM Wes Acuff, Hawks Talon features Connor “DatBoyShotz” Rodrigues, the first overall pick in the 2018 expansion draft, and well known point guard Devin “DevGoss” Gossett, the team’s first-round pick (No. 13 overall) in the 2019 entry draft. Arsonal x (expansion draft, formerly of Celtics Crossover Gaming), Randolph “Rando” Moreno, Jonathan “Jay_a_Fool” Jefferson, and Mark “XxSTL2LAxX” Hampton Jr. (entry draft) round out the team’s season-one roster.